Marine transportation is one of the most prominent uses of ocean and coastal waters. The Mid-Atlantic region hosts some of the nation’s busiest ports, including the Ports of New York/New Jersey, Norkfolk (Virginia), Baltimore, Philadelphia, and Wilmington (Delaware). These ports are crucial links in the nation’s marine transportation system and constitute a key element of the U.S. and world economy. Ports are powerful drivers of regional economic growth, creating jobs not only at the ports, but also in the cities and states beyond the port boundaries (USDOT-MARAD 2013). The maritime transportation sector employed more than 101,000 people in Mid-Atlantic region counties in 2012 (NOEP 2015). Between 2005 and 2010, employment in the transportation sector decreased nationally, mostly due to the recession in 2008-2009 (Kildow et al. 2014). However, the contribution to gross domestic product (GDP) continued to grow throughout this period, indicating long-term productivity improvement in the maritime transportation sector (Kildow et al. 2014). The U.S. seaport network unloads $3.8 billion in goods each day, and the Mid-Atlantic ports are a major contributor. In 2014, ports in Mid-Atlantic states (including the District of Columbia and Pennsylvania) imported cargo worth $265 billion and exported cargo worth $112 billion (NOEP 2015). The Ports of New York/New Jersey and Virginia are among the nation’s largest container ports. In 2014, the Port of New York and New Jersey handled 3.3 million cargo containers, maintaining its position as the busiest on the East Coast with nearly 30 percent of the total market share (The Port Authority of New York and New Jersey). The Port of Wilmington specializes in refrigerated cargo and is a top importer of fruit. Philadelphia and surrounding areas have also become internationally significant petrochemical maritime hubs. Robust intermodal connectivity on roads, rails, and marine highways enable products that go through Baltimore’s ports reach over a third of the country within a day and can handle all types of cargo that enter the U.S. on wheels (from cars to giant tractors), making it the nation’s top roll on-roll off (RO/RO) port (MD-DOT). Known as the world’s largest naval installation, Hampton Roads, Virginia, is ice free throughout the year and hosts a conglomeration of military facilities, coal piers, and shipyards. The Mid-Atlantic region supports important points of departure for the cruise ship industry. In 2011, close to one million people vacationed on ocean cruises originating in New York and Baltimore (USDOT-MARAD 2013). For interactive map, go to MARCO Data Portal and click on Maritime > Port Facilities (Points) > Port Commodity. 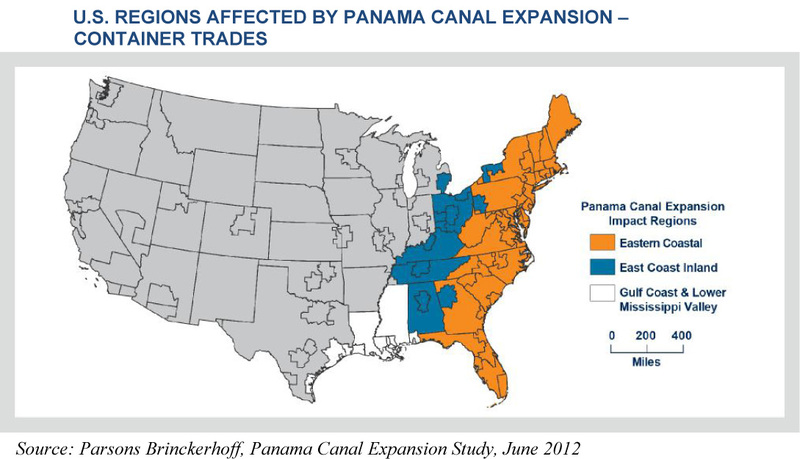 In terms of the global economy, Mid-Atlantic ports rely on connectivity provided by the Suez and Panama Canals. The Suez Canal was expanded recently, and a major expansion of the Panama Canal will likely be completed in 2016, essentially doubling the Canal’s capacity (USDOT-MARAD 2013). The existing locks of the Panama Canal allow the passage of vessels that can carry up to 5,000 twenty-foot equivalent units (TEUs). Once the project is completed, Post-Panamax vessels will be able to transit through the Canal carrying up to 13,000 TEUs (USDOT-MARAD 2013). Mid-Atlantic ports are expected to adapt to handle these larger ships in various ways, including deepening of some harbors (USDOT-MARAD 2013). The U.S. Coast Guard works with other federal agencies, state and local governments, marine industries, maritime associations, and the international community to optimize balanced use and development of the marine transportation system. The Coast Guard is responsible to waterway users for the safe and efficient operation of the marine transportation system. The Coast Guard assists with the identification of navigational risks, conflicts with existing navigational routes, and potential mitigation options. The Ports and Waterways Safety Act authorizes the designation of necessary fairways and traffic separation schemes (TSSs) to provide safe access routes for vessels proceeding to and from United States ports. The designation of fairways and TSSs recognizes the paramount right of navigation over all other uses in the designated areas. The Coast Guard uses Automatic Identification System (AIS) data from vessels to analyze maritime traffic patterns and to determine routes and operating areas. The Coast Guard also collects information in the form of public comments from stakeholders who may not be represented in the AIS data, such as some commercial fishing vessels, small passenger vessels, sightseeing and eco-tour vessels, recreational and charter fishing vessels, yachts, and sailing vessels. 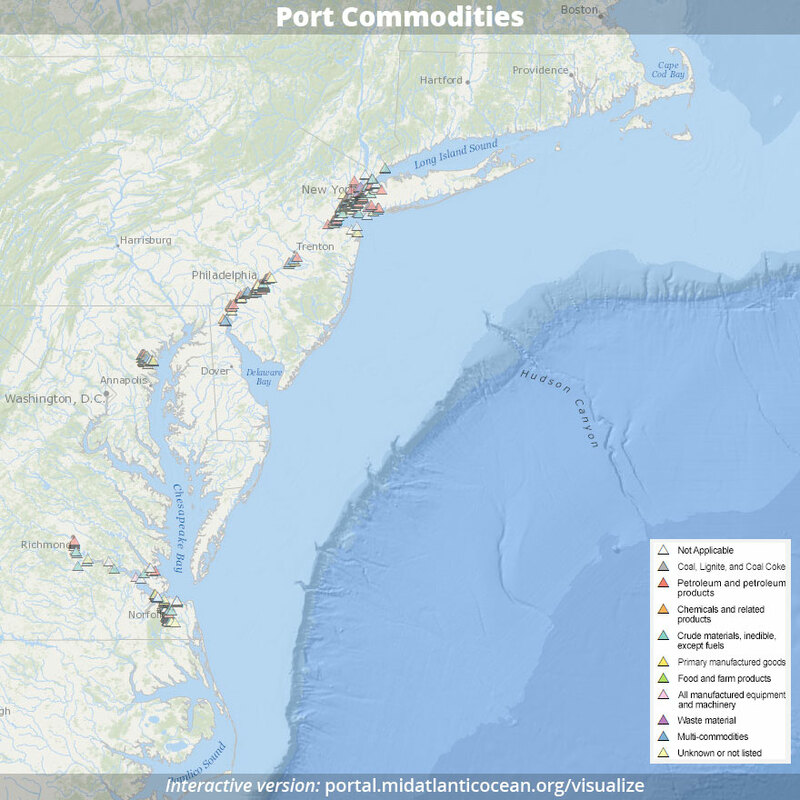 The Mid-Atlantic Ocean Data Portal provides AIS information from 2011-2013, processed to focus on highly travelled shipping routes near port entrances. The Coast Guard and shipping industry stakeholders help to evaluate how well these data indicate total ship traffic density and what additional data may be needed to fully represent shipping activity. 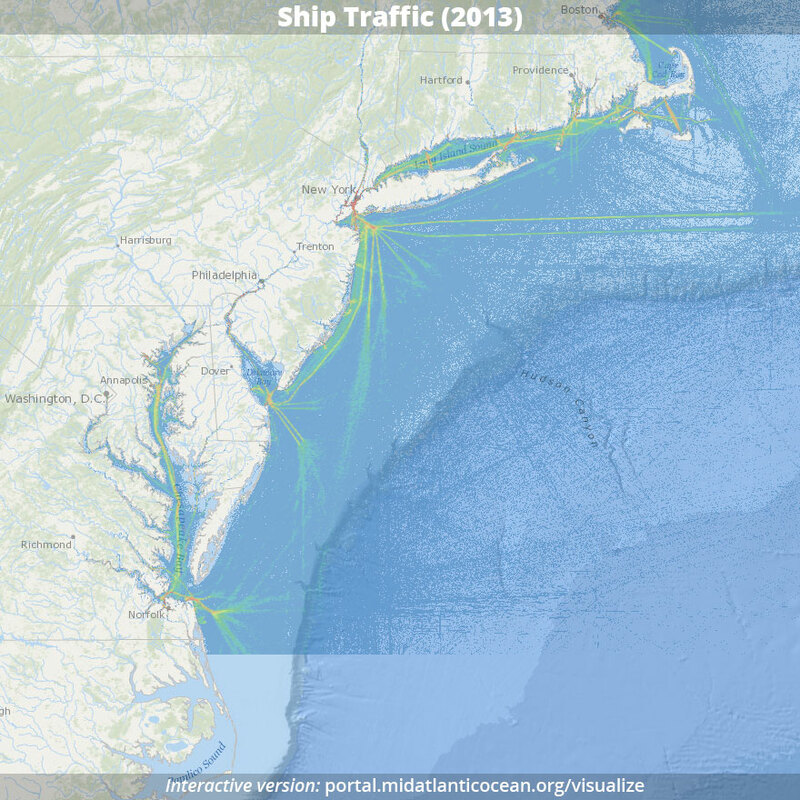 The Mid-Atlantic Ocean Data Portal Team is working with the Coast Guard and the Army Corps of Engineers to develop a process to analyze multiple years of AIS data to detect significant changes in vessel utilization patterns and trends. Vessel traffic patterns for 2013 based on Automatic Identification System (AIS) data. For interactive map, go to MARCO Data Portal and click on Maritime > AIS Shipping Data (2013).